Don’t miss out! There are still a few spaces left in this fall’s Workshop Sessions. Cost is $50 per workshop. 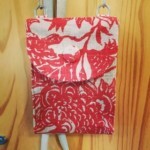 Joan Radell of Bucklebee Bags will be teaching some basic bag making skills as we make a Scooter Mini bag. This is a petite crossbody bag with places for all your essentials. It also makes a great holiday gift! 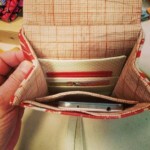 Pattern and hardware will be provided and you only need to supply two or three fat quarters and some interfacing. Our own Debbie Bein will be teaching a new technique to make a fast and easy quilt – with this new technique a quilter can make a lap size, baby or twin size quilt, start to finish (NO KIDDING!) in just two short days (or one long one!) Participants will choose one of several suggested formats while learning how to work fearlessly with piecing, connecting and quilting bias triangles. Let’s call it IMPROV and it’s our NEW SIG! It’s a liberated or free-form way of quilting. Join us as we share techniques, resources, and projects. We’ll meet at the back of the cafeteria at 5:45. Please bring your show and tell to share. Welcome back! 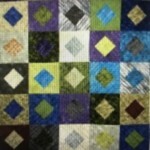 The art quilters will be meeting at 5:45 before the meeting on the 26th. We are moving back to the Teacher’s Lounge for the year. Please bring in a natural object to share, and show and tell to inspire us! The EQ special interest group will meet in the cafeteria at 5:45 be for our Quild Meeting. I will have a monitor to connect to the laptop so that we can all view the program. I will email a project possibility to the members. New members are always welcome. Paper Piecing SIG will meet at Fabric Mart in Yorktown on September 13, October 11 and November 8 from 10am to 1pm. A couple of projects were discussed to work on including the pattern by Violet Craft of either a Lion, Elephant or Giraffe and the Judy Niemeyer Feathered Star pattern. The dates for the next six months are Sept 23rd, Oct 21st, Nov 11th, Dec 16th, Jan 27th, and Feb 24th. All meetings will be at the FABRIC MART quilt shop in Yorktown on from 1pm to 3pm. Meetings are open to anyone.